This entry was posted on October 8, 2012, 12:39 pm and is filed under .Net, TFS, TFS 2010. You can follow any responses to this entry through RSS 2.0. You can leave a response, or trackback from your own site. Anyway I’m adding this RSS to my email and could look out for a lot more of your respective exciting content. Make sure you update this again soon. This did not work on our project. The .NET framework was already set to 4 and kept getting the same error. 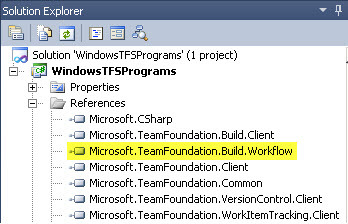 I was told that this project was built in VS 2010 and we are using 2012.